Chris Hillman and three members of The Desert Rose Band will make a rare appearance together on Saturday, Nov. 3, performing an unplugged set at the Scherr Forum Theatre of the Thousand Oaks Civic Arts Plaza in Thousand Oaks, starting at 7 p.m. 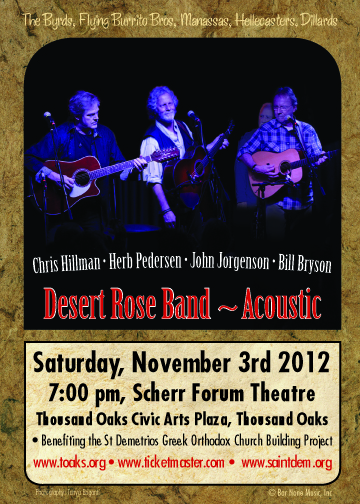 Joining Hillman in The Desert Rose Band~Acoustic are longtime friends and musical collaborators John Jorgenson on guitar/mandolin, Herb Pedersen on guitar and Bill Bryson on bass. The intimate concert at the Scherr, about the closest fans can get to a living-room performance, is a fundraiser to benefit the building project for Ventura County’s St. Demetrios Greek Orthodox Church. Tickets for the show ranging in price from $45 to $125 are on sale now at www.toaks.org, www.ticketmaster.com and www.saintdem.org. Hillman was one of the original members of The Byrds, which in 1964 also included Roger McGuinn, Gene Clark, David Crosby and Michael Clarke. The Byrds were inducted into the Rock ‘n’ Roll Hall of Fame in 1991. After his departure from The Byrds, Hillman, along with collaborator Gram Parsons, was the key figure in the development of country-rock. In the late 1960s and 1970s, Hillman virtually defined the genre through his seminal work with The Byrds and then The Flying Burrito Brothers and Manassas with Stephen Stills. Hillman is also a successful songwriter and has written songs performed by artists as diverse as Emmylou Harris, Patti Smith, Tom Petty and Dwight Yoakam. Hillman went on to form The Desert Rose Band, which became one of country music’s most successful acts throughout the 1980s and 1990s, earning numerous Top 10 and No. 1 hits. The group earned two Grammys and three Country Music Association awards. Although DRB disbanded in the early 1990s, the original members performed a reunion concert in 2008 and have since played a few shows together in select venues. In recent years, Hillman and Pedersen have also toured and recorded as an acoustic duo, focusing on folk, bluegrass and old-time music. Pedersen began his career in Berkeley, Calif., in the early 1960s, playing five-string banjo and acoustic guitar with people like Jerry Garcia, David Grisman and David Nelson. His recording discography is diverse and reflects the singer/songwriter era of the 1970s and 1980s. Pedersen is highly respected among musicians and music aficionados, as demonstrated by his work with artists as varied as Earl Scruggs, Old and In the Way, Peter Rowan, Gram Parsons, Emmylou Harris, Stephen Stills, Linda Ronstadt, Kris Kristofferson, John Prine, Jackson Browne and John Denver. Jorgenson is known as a pioneer of the American gypsy jazz movement. Jorgenson first came to national prominence with The Desert Rose Band, when he was honored as the Academy of Country Music’s “Guitarist of the Year” award three consecutive times. Bryson is best-known for his unique style which is reflective California culture and its melodic strains, country-rock overtones and laid-back rhythms. He appears on several Ry Cooder soundtracks and played banjo in the film “The Long Riders.” Bryson is also an accomplished songwriter; one of his best-known originals is “The Girl at the Crossroads Bar,” recorded by The Grateful Dead as well as The Laurel Canyon Ramblers. In the Santa Clarita Valley, Hillman and Pedersen appeared as a duo on SCVTV’s “House Blend” with host Stephen K. Peeples in summer 2011 (see Part 1, Part 2, Part 3 and Part 4), while Pederson, Bryson and veteran multi-instrumentalists Tom Sauber and Patrick Sauber guested on the popular music-and-interview show with their old-time acoustic music offshoot quartet Loafers’ Glory in May 2012 (Part 1 and Part 2). In addition to his “Peeples Place at KHTS” blog, Stephen K. Peeples is a writer/reporter and photographer for KHTS News (www.hometownstation.com) and SCVNews.com He is also host, writer and co-producer of the weekly “House Blend” music and interview television show on SCVTV, community television for the Santa Clarita Valley (www.scvhouseblend.com). A former SCV music/entertainment columnist for The Signal (2004-2011) and drummer with SCV jazz group RainTree (www.raintreejazz.com, 2010-2011), Peeples is a Grammy-nominated record producer (“Monterey International Pop Festival,” MIPF/Rhino, 1992), an award-winning radio producer (“The Lost Lennon Tapes,” Westwood One, 1988-1990) and an award-winning online editor (The Signal website, 2007-2011). For more information, email skp@stephenkpeeples.com or visit www.stephenkpeeples.com.